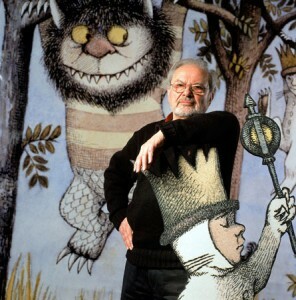 Maurice Sendak, author of 1963 classic “Where the Wild Things Are” has passed away from complications due to a stroke. It is a sad day for those who grew up loving this book. The Caldecott Medal winner has touched hearts and influenced the imagination of many generations and will continue to do so as time goes on. Sendak, though best known for his work on WTWTA, has had a prestigious life in both theater and literature. Known for other books such as “In the Night Kitchen”, and “Outside, Over There” which won him a National Book Award in 1982. Sendak also worked with the creators of Sesame Street, and on stage with the likes of the Houston Grand Opera and the New York City Opera, as well with Tony Kushner on an English version of the Czech children’s opera “Brundibar”. The illustrated book version, drawn by Sendak, featured text by Kushner and was named one of the 10 best illustrated books of 2003 by the New York Times Book Review. Maurice Sendak’s own childhood was not an easy one. Losing most of his family during the holocaust, and suffering from health problems that left him bed ridden, Sendak found inspiration and new life after watching Disney’s “Fantasia” at the age of twelve which inspired him to be an illustrator. Though Unspeakable Gibberer deals mostly with things of a stranger nature, I believe it is important to pay homage to a great person who inevitably help create/build the imaginations of millions. With out him we may never of thought it possible to imagine new worlds that we ourselves could visit in our minds and still return home. Maurice Sendak you will be missed. This entry was posted on May 8, 2012 by David Joseph. It was filed under Strange Reports . It’s because of books like his WTWTA that helped fuel my imagination as a kid and inspired me to draw. Thanks Mr. Sendak. Rest in peace.